Where is it ? about 65 kilometres west of Faro airport, approximately one hour by car. 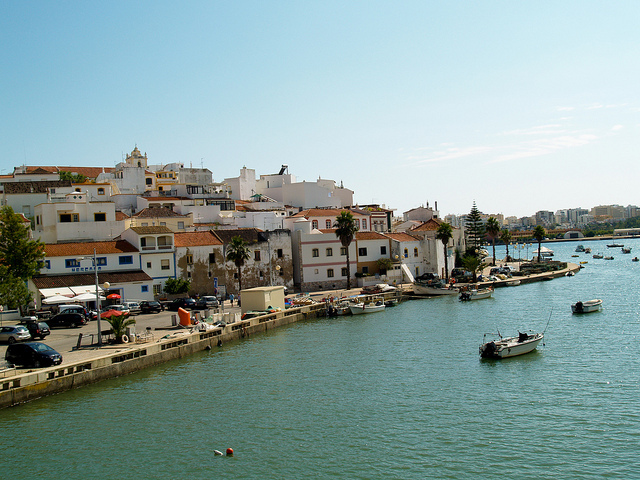 Ferragudo lies on the east side of the Arade river facing Portimao and Praia de Rocha. Who goes there ? The town has some pretty walks and sites and although not entirely touristy it does get some overspill traffic from nearby Portimao and Praia da Rocha. Expect a quieter time here than the former resorts. What about Food and accommodation ? Ferragudo has some excellent restaurants and bars. You will find a better selection of accommodation in nearby Praia da Rocha. On holiday in Ferragudo, you can forget hustle and bustle. For this is a charmingly sleepy place, all whitewashed lanes, flower-decked steps and bobbing fishing boats which really go fishing! Come the evening, you can pull up a chair at a harbourside restaurant and watch the catch of the day sizzle on an open-air barbecue. Gleaming white buildings topped by warm terracotta pile up the hill like an oversized wedding cake, with the village’s church perched on top commanding sweeping views of the estuary below. Whether this is a late deal or a family summer holiday, a good beach is likely to be near the top of your tick list. Ferragudo delivers with the velvet sands of Praia Grande just around the rocky headland, where the sea wall creates sheltered conditions for windsurfing. Venture a little further along the coast to discover cliff framed coves of honey coloured sand such as Praia dos Caneiros. Travel to Ferragudo and you’ll find yourself well placed to explore west to lovely Lagos, where sun dappled squares and pavement cafés beckon, or north to the pine scented Monchique mountains where the air is cooler. Ten minutes drive to the east brings you to Carvoeiro where great restaurants and a low-key holiday atmosphere await you. Of course, you may prefer to while away an hour or two sampling the ice cream and pottering around the craft shops in Ferragudo’s sunlit, cobbled, main square.As part of the freguesia of Lagoa and of Estômbar in the Lagoa Municipality, it was separated from Silves Municipality on January 16, 1773. Up until the late 20th century, Ferragudo was the home mainly of fishermen, who worked the waters of the Atlantic Ocean and the estuary of the Arade River and the river itself. Today its economic life is mostly tied to the tourist industry..When it became a town in 1999 it absorbed other villages and hamlets such as Aldeia de S. Francisco, Vale de Azinhaga, Corgos, Gramacho, Presa de Moura and Vale de Lapa.Bordered on the west and south by the Arade River and the Atlantic Ocean, Ferragudo is noted for its picturesque scenery, its good fishing and its beaches: Angrinha, Caneiros, Torrados, Infanta, Afurada, João Lopes, Molhe, Pintadinho e a Praia Grande. Among the natural scenic sites is the Ponta do Altar as well as various cliffs, underground caverns, vent chimneys and steep islets.